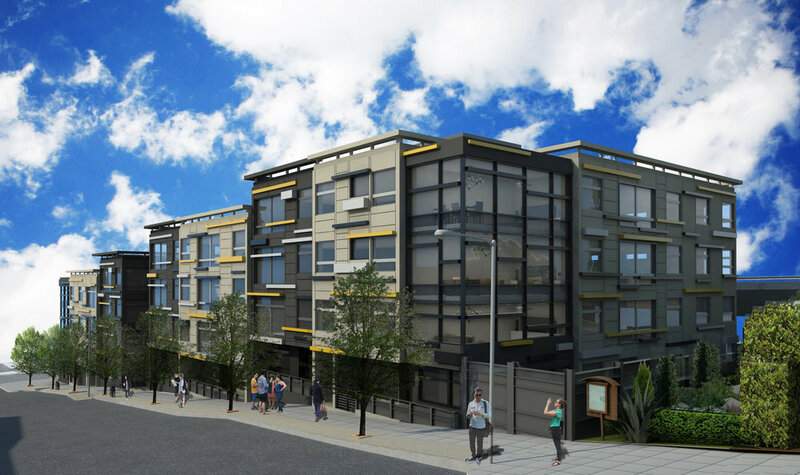 4-story mixed-use building in Potrero Hill that will feature 59 residential units over 3,400 sq. ft. of new Production, Distribution & Repair (PDR) space at the ground level, as well as a basement garage accommodating 44 parking spaces. D-Scheme Studio is working on the design, permit drawings, and construction observation for the development. One of the key features of this project will be vertical green wall separating the building from the adjacent I-280 freeway. The Center Hardware warehouse building at the base of Potrero Hill, will be razed and a modern four-story building designed and newly refined by D-Scheme Studio, with 59 condos over 3,400 square feet of new Production, Distribution, and Repair (PDR) space and a basement garage for 44 cars, will rise up to 40 feet in height across the 249 Pennsylvania Avenue site. As designed by D-Scheme Studio for the development team, a modern four-story building with 59 residential units over 3,400 square feet of PDR space and a basement garage for 44 cars will rise across the 249 Pennsylvania Street site.